…until now. Stanislav wrote some new material, which he wanted to record in professional circumstances. He took care of the lead vocal parts, guitars and programming, and he did produce the album too. This time he was assisted by guitar player Lars Abrahamsson, drummer Kateryna Osmuk (she did the few soprano voices too), Malcolm Sohlen on bass, and Andrey Tkachenko (of N¢O / Human Collapse / Vin De Mia Trix fame) as guest for ‘shrieks and choirs’. Everything was re-amped (whatever) by Dan Lowndes at his Resonance Sound Studio (think: Desolate Shrine, Absu, Draghkar, Spectral Voice, Förgjord, Death Fortress and many, many more). The final mix and mastering were done by Stanislav himself, except for the vinyl-edition, which was mastered by nobody else but Billy Anderson (Dukatalon, Amenra, Thrall, Grime, …). 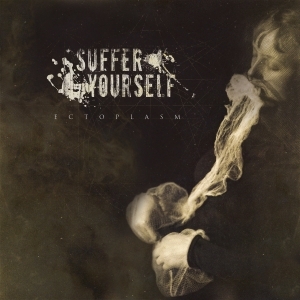 Ectoplasm gets released via the digital sources, as well as on tape, on vinyl, and on compact disc. The latter goes for a four-panel digipack edition with a twelve-page booklet, or a ‘normal’ jewel-case CD with an eight-page booklet, including quite sober yet very appropriate, fitting artwork. The album consists of five compositions, which last in between seven and twenty minutes, clocking over one hour all together. Indeed, it’s a lengthy trip, but as said before: it’s worth it! The album starts with the title track (10:32). It opens quite creepy, with haunting drones and eerie ambience, weird synth lines and ominous whispers. Where would it lead us to? But then it evolves into what we can consider as the core of Suffer Yourself: monumental Funeral Doom with a suffocative atmosphere. It’s extremely slow and ultra-heavy, based on massive string lines and hammering drums, with wretched screams and, especially, extremely deep growls. But the melodies are permanently injected by changes in tempo, and several intermezzos. Acoustic and semi-acoustic parts, symphonic and spherical chapters, sharp and sometimes quite weird solos, classically skilled soprano voices and bewitching choirs (reminding me of those cult horror movies from the Seventies), spoken words, piano, some malicious outbursts, and so on. Indeed, the usual ingredients, but brought from a level that high… Besides the huge variety and besides the many levels and layers, this piece is so cohesive, so evidently natural in its execution. The Core is with its length of 7:15 the shortest piece on Ectoplasm. Even in such a compact composition, Suffer Yourself succeed to put so many layers in it. Here too hypnotism and heaviness go hand in hand. If someone would ask me how Funeral Doom sounds like, I would have this song as a primal try-out. The Core is like the core of this wonderful (and largely underestimated) genre. But the band goes further than ‘just Funeral Doom’, as defined through the first two songs. Well, this is the very same case for track number four, Dead Visions, which is, by the way, and for what it’s worth, my favourite one on this album. It clocks 19:25 minutes, and it’s like a whole conceptual album on its own. This epic contains the same majestic elements from the former ones, with so many things to experience. There is much variation in structure, tempo and atmosphere, yet at the same time being really cohesive. The lyrics, FYI, contain excerpts from e.g. Edgar Allan Poe (no introduction needed, I guess) and Zinaida N. Gippius (a Russian writer / poet / philosophe who was married to Dmitry Merezhkovsky) – the latter being sung / spoken in the native tongue (but translated in the accompanying booklet). Anyway, Dead Visions is Funeral Doom from the highest order. Besides all things mentioned before, this track also includes xylophone-alike sounds, bells, trains (don’t try not to believe me), weeping… The second half has so much to offer, and the finale at the end makes me fly away into formlessness. What beautiful, precious keyboards at the end of this composition, mingling delightfully with those simplistic yet genial bass and electric guitars, those slowly hammering drum patterns, these abyssal growls and the subtle use of bells! Transcend The Void (7:31), finally, was created with assistance of Canadian Ambient musician François Bilodeau. It starts in a cold way, with a creepy droning melody, then joined by spoken words and whispers, still painting a saturnine soundscape of loss and desolation. The guitar lead is bewitching and mesmerizing (and hey, is that a hint of Twin Peaks going on, at about half of the track?). Even this Sludge / Drone / Doom epic expounds the glorious skills of Suffer Yourself. Rather than depressing, this album stands far away from the DSBM-scene, for example. Both genres are closely related, but in this case the focus lies on disgust and disappointment rather than suicide. Yet the unhappy and melancholic character for sure remains!